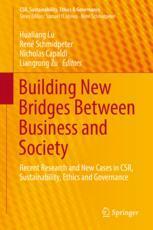 A book chapter by me on "Sustainable Logistics" appeared in "Building New Bridges Between Business and Society - Recent Research and New Cases in CSR, Sustainability, Ethics and Governance" published by Springer. An increasingly globalized world with distributed supply chains and global product distribution depends more and more on logistics. At the same time the negative effects of logistics on the environment and society grow. On the one hand logistics consumes resources such as energy, raw materials and space. On the other hand logistical activities cause emissions such as pollutants, greenhouse gases, waste or noise. Moreover the trend of urbanization poses challenges to logistics in urban areas and cities and social aspects such as noise pollution, traffic accidents and jams become an issue. To counter these effects and respond to the challenges at hand sustainability gains more and more weight in logistics as expressed in the concepts of Green Logistics and City Logistics. The author offers a framework for Sustainable Logistics based on the research for a German book project with several experts in the field and draws conclusions for possible further research directions from it.